We are so fortunate to live in the New York City area. The only problem is when you have to go down 5 days a week for work, like my husband did, the last thing you want to do is go back down on the weekend. Hence, the spouse doesn’t spend as much time in NYC as they’d like. But all that changed when he retired and the city has taken on a new charm and appreciation. We’ve started going to a lot of plays and lectures at the 92 Street Y. We recently decided to be decadent and spend a few night in the city during the week. Based on what we wanted to see and do, I chose the Tribeca area for our home base. Tribeca is probably most notable for the Tribeca Film Festival and Robert DeNiro. It was an enclave for artists in the 1960s and 70s and has maintained its creative roots. If you just wander like we did, you’ll find that the cast-iron buildings hold gems around every corner. You may stumble upon a quiet bar, a pop-up clothing boutique, a Michelin restaurant, or an independent art gallery. It’s definitely not a tourist area, which suited us just fine. It has a real residential area vibe. It’s a great location for lower Manhattan. If you keep walking, you can visit downtown, the lower east side, and Brooklyn to the south and SoHo, the West Village, Chinatown, Little Italy, and Chelsea to the north…. I always look first for a boutique-type hotel. I like small and a little quirky. So, that’s how I started my search in Tribeca. I googled best hotels in Tribeca and found Duane Street among them. I gave a few names to my travel agent, and she came back recommending it. With that and not wanting to spend a lot as we were not going to be in the room much, I settled on this gem, the Duane Street Hotel. We weren’t quite sure when we first drove up as it sits on a busy corner of a nondescript area of Tribeca. It was very cute, with bikes out front, but my first thought was it’s going to be noisy. When we walked in, any concerns went away. We found a modern decor with a cute bar and sitting area with a Christmas tree and very welcoming staff and it was quiet, even on the first floor. The Duane has 43 rooms on 6 floors. While our Executive King room was not large, it offered more than enough space. We were on the 5th floor and never heard a sound. The rooms are decorated in chic black and white. The hotel offers special packages, so be sure to check it out before you book. Rates start around $200/night for a Superior Queen and will depend on the time of year. There is a restaurant on the premises, Graffiti Earth. We didn’t eat there, because there are just so many options to choose from. I did read very good reviews, however. Duane Street Hotel is part of the IC group with hotels on the east and west coasts. It was a tough decision picking restaurants for only two nights. But I did it and chose correctly. Everything about our experience at Restaurant Marc Forgione made us happy. From the rustic decor to the atmosphere to the service to the food, it all surprised and amazed. I’m a sucker for brick walls, so was sold from the minute we walked in. 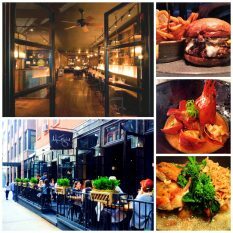 Photo credits Restaurant Marc Forgione. But what always is a good indication of things to come is when your waiter asks right off the bat if you have any allergies or preferences that he needs to be aware of. I’m vegetarian, so he steered me right away to what I could have on the menu, but added that the chef would be happy to prepare a dish for me. The Kona Kampachi, Honeynut Squash Salad, and Halibut en Croute were impeccable. If you can share, go for the Chicken Under a Brick or the Porterhouse. “Nobody shoplifts from a store that knows 3,214 ways to murder someone.” That’s what you’ll see on a sign at the Mysterious Bookshop. If you love mystery novels or just old book stores, the Mysterious Bookshop will amaze. Opened in 1979, the bookshop is the oldest mystery specialist book store in America. I loved the cozy decor brimming with books up to the ceiling and of course, the smell of old books. From true life to espionage to vintage and foreign mysteries, this bookshop is ALL mysteries. They offer a great selection of classics, plus new titles, periodicals, signed first editions, rare/collectables, limited editions, and Sherlockiana. Yes, it is a word and refers to memorabilia and works of fiction of Sherlock Holmes. The staff was very helpful with suggestions, not being a mystery buff I needed help. What a great gift for anyone you know you loves mysteries. The prices seemed reasonable. They also do book signings and readings. If you love to buy Made in USA, Shinola could be the store for you. Everything is from Detroit. The store was founded in 2012 with the goal of reintroducing domestic manufacturing on a scale that would shape culture, create community, and deliver goods of the highest quality. They have a watch and leather factory and a bike workshop. The product line includes watches, bicycles, leather goods, home audio, jewelry, gifts and accessories. If you love croissants, you’ll be in heaven. Some say that Arcade Bakery’s croissants and baguettes are the best in the city. I probably wouldn’t argue the point. Hidden in the lobby of a historic Tribeca office building, the 20-seat retail bakery is actually a stunning space. Baker Roger Gural took his expertise from France and the Bouchon Bakery in Napa and turned it into an amazing bakery filled with a variety of pastries and crusty breads. I was so happy to find Arcade Bakery. It’s exactly the kind of gem you hope to discover by accident as you wander the city. Besides pastries, you can also get sandwiches like ham and cheese and New York-style pizza. Being in an office building, it’s open 8-3 during the week and is closed on week-ends. We stumbled upon this shop just walking the neighborhood. I happen to love antique posters and have a few in my house, so I was more than happy to spend some time just browsing. The store is packed with thousands of vintage posters and prints from around the world. In fact, it is said to be largest vintage poster gallery in the world. They can make great gifts, too, especially if you know someone’s favorite movie or as a housewarming gift for the kitchen. Photo credit Philip Williams Posters. Okay, it’s not exactly a find, but the location makes Tribeca very special. Perhaps the biggest positive is that it’s not a touristy area at all. It’s very quiet and full of locals. You see kids being taken to school in the morning, business people gathering at a local diner for breakfast, and local residents stopping by for a drink at a restaurant after work. After you’ve spent much time in areas such as Times Square and Union Square, you’ll appreciate the untouristy aspect that is Tribeca. Definitely worth a visit. Which Fabulous Finds will be next?